Come out and support the PrettyGirlsRockinPink team as they co-host with 6 Lounge to raise funds for Breast Cancer Awareness during the Race for the Cure weekend. $6 Drink Specials, Pink Carpet, and Best Dressed Contest. 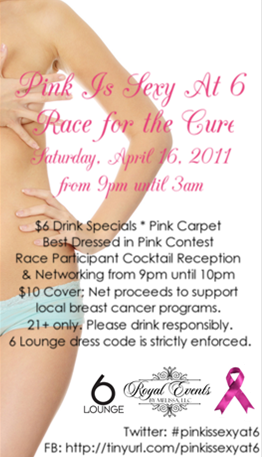 $10 cover with net proceeds support local breast cancer programs. If you and your party would like to book a table for bottle service, please email 6 Lounge at info@6indy.com. Best Dressed Contest: Ladies, you must submit a picture of yourself in pink attire the night of the event and post to this Facebook event page. Then invite your friends to vote for you by clicking the like button. The winner will be determined by the individual with the most votes. Winner receives personal fitness package and boudoir photo package.